This concert is generously sponsored by Mr. Sam B. Ersan Exclusive Print Sponsor Photographing or recording this performance without permission is prohibited. Kindly disable pagers, cellular phones, and other audible devices. Although rare, all dates, times, artists, programs, and prices are subject to change. The eminent British musicologist Donald Tovey (1875-1940) called Haydn’s Quartets Op. 20 “a sunrise over the domain of sonata style and quartets in particular.” The word “sunrise” is notable for a couple of reasons. First, the six quartets contained in Op. 20 are sometimes referred to as the “Sun Quartets” because of a drawing of the rising sun on the title page of the original printed edition. Also, “sunrise” is symbolic because, although Haydn wrote twelve quartets prior to this, the Op. 20 quartets lay the cornerstone for string quartet composition for centuries. Among Haydn’s innovations in these quartets are the independence and equality of the four instruments. Composed in 1772 at the age of forty, the Op. 20 quartets fall within Haydn’s Sturm und Drang period, notable for its agitated, tragic, and sometimes unpredictable melodies and events. In the second of the quartets, the cello, hitherto assigned an accompanying role almost exclusively in string quartets, is given the melody at the beginning of the first movement and shortly after is joined by the second violin, another instrument normally relegated to the background. Sturm and Drang elements become more obvious as the movement enters the development section. The movement ends softly, suddenly, and playfully. The independence of voices is notable in the first movement as there is only one measure where all four instruments play the same music simultaneously. Thus having the quartet all play the same thing at the beginning of the second movement comes as a surprise. The music here moves to the darker key of C minor and features tragic outbursts, mournful cello melodies, and violin solos that push the music into adventurous harmonic territory. The middle section in E-flat major provides a brief respite. The Minuet third movement begins without a break. Immediately a “bagpipe” sound is heard in the second violin, which plays the drone typically associated with that instrument. This minuet is a calm dance throughout. Almost nothing in the movement is played forte. The four players again show their independence in the finale: a tour-de-force“Fugue in Four Voices.” Like the third movement, the finale is almost all played softly with a forte heard only in the last minute. In this finale, the musicians do not have a single measure together except for the closing measures when all join together to bring the work back to the home key of C major. SCHuBert: StriNg QuArtet No. 10 iN e-flAt mAjor, D. 87 Growing up with musical siblings and as a talented violist himself, Schubert was able to use his family as a musical research facility. This was particularly true for string music when Schubert joined his cello-playing father and his two brothers who played violin. In 1813, at the age of sixteen, Schubert composed up to six string quartets, the last one being the one in E-flat major. The “premiere” took place in his family’s living room. Unlike the Haydn and Beethoven quartets on the rest of the program, Schubert’s quartet does not feature independence of the quartet musicians, but here they play almost everything together or the first violin leading with the others accompanying. Unusually, all four of the movements are in the home key of E-flat major. The first movement, marked Allegro moderato, is subdued and graceful but includes a few impassioned outbursts. opening “call and response” beginning in the cello, the music takes off on a wild journey of abrupt changes in mood, harmony, and dynamics, driving the music to a joyous conclusion. 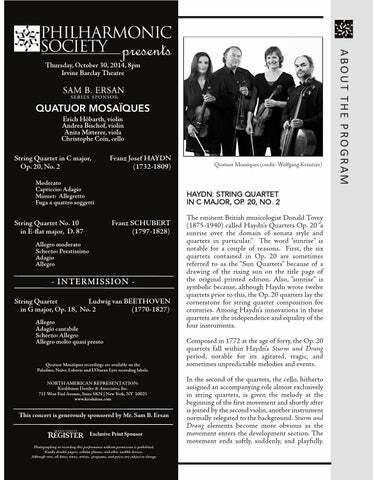 - Program notes by Christopher Russell ABout QuAtuor moSAïQueS Quatuor Mosaïques is the most prominent period-instrument quartet performing today. The ensemble has garnered praise for its atypical decision to use gutstringed instruments which, in combination with its celebrated musicianship, has cultivated its unique sound. The quartet has toured extensively, won numerous prizes and established a substantial discography. Formed in 1985, the group is comprised of Austrians Erich Höbarth (violin), Andrea Bischof (violin), Anita Mitterer (viola) and French cellist Christophe Coin. Quatuor Mosaïques has an extraordinarily extensive discography which includes works of Haydn, Mozart, Arriaga, Boccherini, Jadin, Beethoven, Schubert and Mendelssohn as well as modern composers. Of the group’s 2010 Schubert release, The London Times wrote, “their performance of Death and the Maiden is music-making of a high order, felt and carried out by players animated as though by a single mind and impulse, yet each of them seeming to respond afresh at every moment.” Recordings of the Wiener2 Klassik repertoire (Haydn String Quartets Opp. 20, 33 and 77 and the quartets of Mozart dedicated to Haydn) have been awarded numerous prizes, such as the Diapason d'or, the Choc du Monde de la Musique, and a Gramophone Award. These four musicians met while performing with Nikolaus Harnoncourt's Concentus Musicus Wien in the 1980s and decided to perform on original instruments as a classical “caper quartet.” Although the quartet performs on period instruments, it embraces the European quartet tradition, constantly allowing for the evolution of its repertoire as it strives to reveal the music’s psychological underpinnings. eriCH HöBArtH was born in Vienna, where he studied with Grete Biedermann and Franz Samohyl, and later at the Musikhochschules of Vienna and Salzburg. He was a member of the Végh Quartet from 1978 to 1980, and subsequently held the position of Concertmaster of the Wiener Symphoniker for seven years. Since 1981, Mr. Höbarth has been Concertmaster and soloist for the Concentus Musicus Wien; he also teaches at the Musikhochschule in Vienna and has served as Concertmaster of Sir András Schiff 's chamber ensemble Cappella Andrea Barca. Mr. Höbarth plays a Joseph Guarnerius violin made in Cremona in 1705. ANDreA BiSCHof was born in Vorarlberg and studied in Vienna with Grete Biedermann and Thomas Christian. Since 1980, she has held the position of Concertmaster and soloist of the Austrian Bach Soloists, and is also a permanent member of the Concentus Musicus Wien and Professor of Chamber Music at the Musikhochschule in Vienna. Ms. Bischof plays a violin made in France in the 18th century, maker unknown. ANitA mitterer was born in Lienz in the Osttirol, and studied with Jürgen Geise in Salzburg, Antonin Moravec in Prague and Thomas Christian in Vienna. She is a member of Concentus Musicus Wien, Director of the Baroque Ensemble of Salzburg and teaches violin and viola at the Mozarteum in Salzburg. Ms. Mitterer plays a Carolus le Pot viola made in Lille in 1725. CHriStopHe CoiN was born in Caen, and studied with André Navarra in Paris, Nikolaus Harnoncourt in Vienna and Jordi Savall in Bâle. He has performed with L'Orchestre des ChampsÉlysées, Concentus Musicus Wien and the Orchestra of the Age of Enlightenment, among many others. Mr. Coin teaches Baroque violin and viola da gamba at the National Conservatory of Music in Paris and at the Schola Cantorum in Bâle. He teaches annually at the International Academies of Granada and Innsbruck and gives master classes throughout France. Mr. Coin plays an Alessandro Gagliano cello made in Naples. Carnegie Hall in 2009, The New York Times noted that the group performed with “elegant, detailed phrasing and carefully wrought playing.” During a North American tour in 2012, The Philadelphia Inquirer raved, “the group does tap into something well beyond notes and rests. No doubt this is what people mean when they talk about music casting a spell.” European engagements this season include a four-concert residency with Wiener Konzerthaus and performances at the Haydn String Quartet Festival in Eszteráza, Hungary. During summer 2015 Quatuor Mosaïques gives two concerts at the Aldeburgh Festival (UK) and Wigmore Hall.